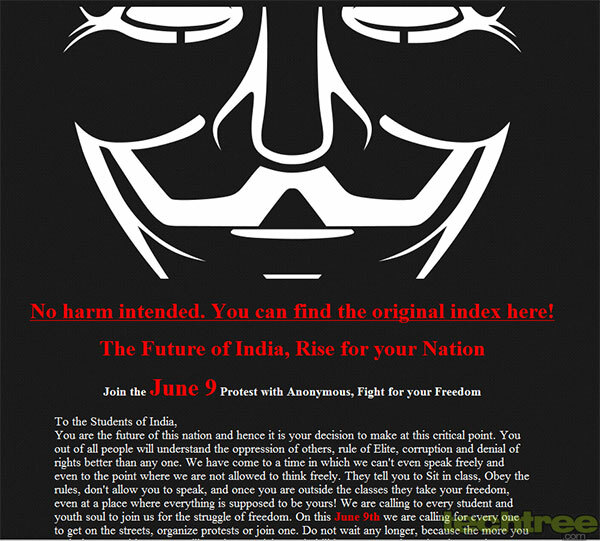 Provides link to original unaltered sites as well, exhorts Indians to join 9th June protest. Continuing in its new quest to take the protest against India's web-censorship to the streets, Anonymous has now blocked several websites belonging to the government of Mizoram. The hacktivist has put up its own page when you visit these sites, clarifying that it means no harm. To make its harmless intentions clear, the group has also provided links to the original index page for those who want to access these websites. These include the state's Prison, Land Revenue and Settlement, and Police departments, among others. A list of a few more of the defaced websites can be accessed here. The group wants people of the North-Eastern states to "wake up" and join the rest of the country in protest against the national government's policy of blocking websites it deems unsuitable. We had earlier carried a report about the planned protests to be held at various cities across the country. Will you be joining the peaceful protests, or will you support the Talibanisation of the internet? The choice is yours.